Will this be the year you learn to ride? Will 2016 be your year, the year you learn to ride your own motorcycle? If you’re like me, you don’t just jump in to something like this: you take some time to educate yourself about the potential joys and dangers, pros and cons, and what you need – physically, practically, and mentally – to get started. And if you’re EXACTLY like me, you stomp around for two years in your wanna-be boots, trying to visualize your two-wheeled future. But I digress. Whether or not this does turn out to be “your year,” you might find it helpful to gather perspectives from women who DO ride, on what you need and what it takes to be successful in getting started. Buy GET ON for Kindle here! Buy GET ON in PDF or ePUB formats here! 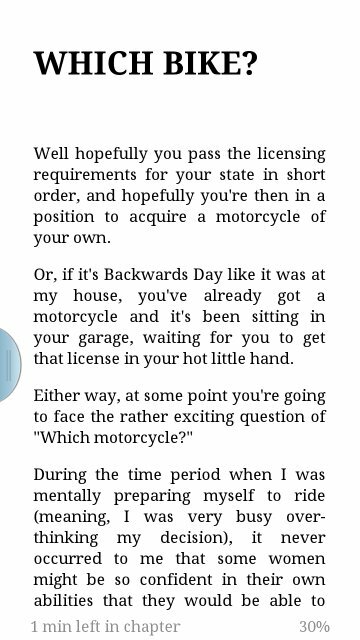 Beyond the e-book, I am always keen on fielding questions about anything related to riding. Share your questions anytime by commenting on blog posts, finding me on Facebook or Twitter, and/or by email! See my sidebar links to connect via other social sites, and thank you for reading! 50,000 watts of Corn Dog! Listen Sunday, June 28! This Sunday, June 28, I have an amazing opportunity: I’m going to be the guest on “Sportsman’s Notebook,” a Sunday morning program on 1040-WHO Radio! My Iowa friends and followers will know two things: 1 – The host of the program, Keith Kirkpatrick, is an Iowa Treasure, having been an on-air personality at WHO Radio for more than six decades. And 2 – WHO Radio is the premier talk and news radio station in Iowa. It’s signal reaches far and wide across the country – and did so even in the days before the internet. Keith tells me his show normally focuses on hunting and fishing in Iowa, but he saw my presentation at Edgewater back in May and invited me on because he could tell I was enjoying the beauty and bounty of Iowa in my own way and wanted to showcase it. I am THRILLED – we will be talking about riding and enjoying Iowa by motorcycle, my e-book “GET ON,” and much more! You should be able to listen LIVE at iHeartRadio or the WHO Radio website itself at http://www.whoradio.com/main.html. Thinking about learning to ride? GET ON with my new ebook! Click here to buy GET ON in Epub format for Nook and other e-readers! If you’re a woman who’s been thinking about learning to ride your own motorcycle, but are wanting to understand the risks and rewards more fully before getting started, now you’ve got a new resource for information and encouragement. 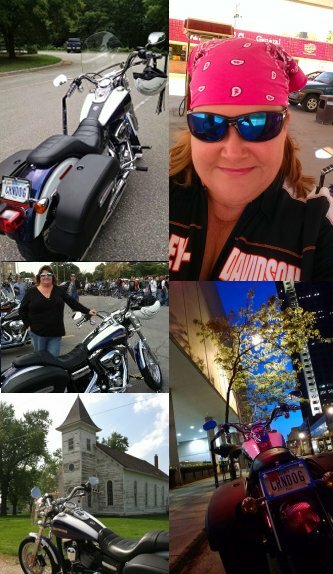 If you’re a fan of Biker Chick News and want to know a little of my “Corn Dog backstory,” you can learn more about how I got started riding and how I overcame the challenges I faced. And if you’re one of my beloved curious/horrified on-lookers and you just want to support my latest writing venture because you love me, well who am I to argue with that! Whatever your motivation, it’s my sincere hope that you will enjoy GET ON! You can purchase GET ON at one of the links shown above, and of course you can follow my writing journey at my author website: www.janetgreenbooks.com. I thank you, from the bottom of my heart, for purchasing GET ON! Author website is now live and online! Why an author website and not a “Get On” website? Well, because I’m definitely planning more than one book, and I want to have a place to gather them all together. Please feel free to pay a visit and stroll around the author site… more to come, very soon! Haven’t been on any rides since mid-September, but only because I’ve been spending every free waking moment not only fine-tuning the e-book, but also learning the ins and outs of e-publishing. I believe I have the Kindle version completely done and ready to go. Here’s a screen shot of what it looks like on the Kindle Reader on my computer. See that gray area on the left? That’s a clickable table of contents and it cost me a day of my life and a bit of hairpulling to get that to work! By the way, THANK YOU for sticking with me while I blog about the e-book! Once I launch, I’ll have an author website for those posts and we’ll be back to regular programming here. 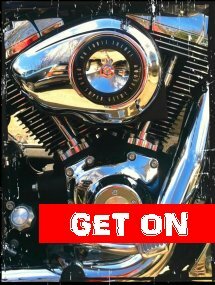 E-Book, ‘Get On’ coming October 25! I am publishing an e-book! 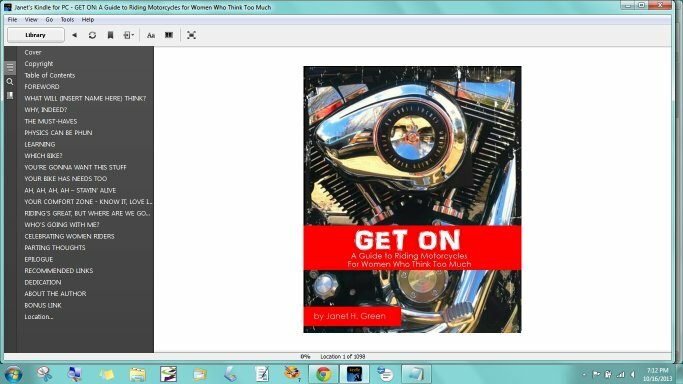 GET ON: A Guide to Riding Motorcycles for Women Who Think Too Much is a funny, informative, inspiring and affordable e-book for women who want to ride but are holding out because… well, probably for some of the same reasons I was holding out all those years ago. But my new book will answer their lingering questions and give them the shove they need to twist that throttle on their own motorcycle! GET ON will be available beginning Friday, October 25 for Amazon Kindle and as a direct-download PDF document. A Nook edition is also planned, as well as a direct-download EPUB file for e-readers such as Calibre.